Update 28 November 2018: the provenance and claims about the appearance of the gun in Dr No is questioned, more on the AJB forum. Update 29 November 2018: the auction has now been canceled by the auction house, after doubts about the provenance of the item. 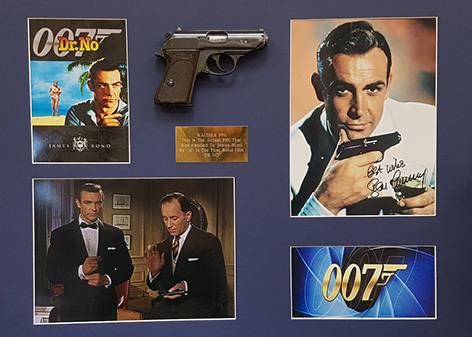 Lot 441 at the Jewellery, Antiques, Registration Plates & Furniture Auction is a presentation case (52cm x 72cm), containing the actual (EU deactivated) Walther PPK pistol, a montage of facsimile James Bond advertising photographs and an engraved brass plate Walther PPK. Complete with current EU Deactivation Certificate No 3644 dated 23/1/2018 and bearing serial number 149894. The item also comes with a signed letter from Bernard Lee, dated 1974, which explains how the gun ended up in the film. "Dear Jane, I know you will not accept anything in return for all your help and the kindness that you and John have shown to me throughout these trying times but my conscience will not let it go unrewarded. Enclosed is a small token of my gratitude that I would like your boy to have as and when you see fit. 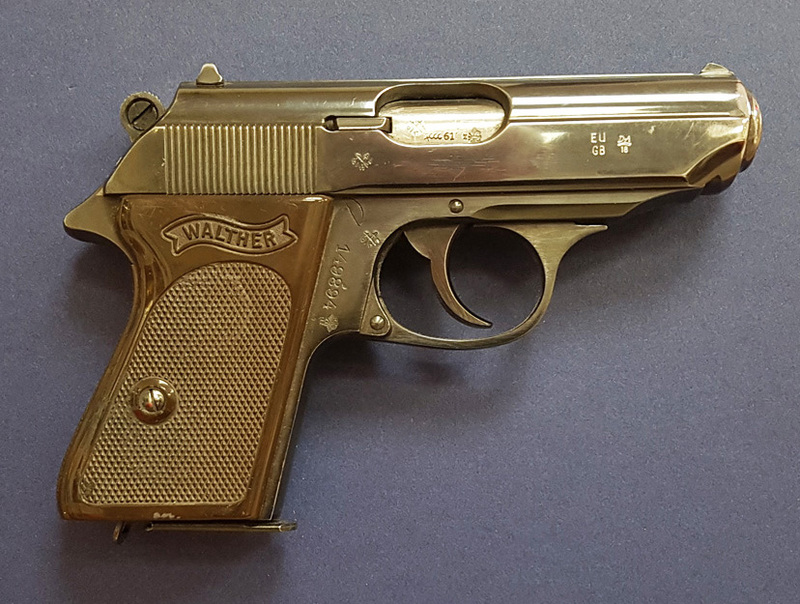 This Walther pistol numbered 149894 is a small piece of 007 history. As you are aware I have played the part of M in several of the James Bond films. The first of these, Doctor No contained a scene in which Sean was scolded by myself about his choice of firearm. His Beretta pistol was replaced by a Walther pistol. On the day of the take the pistol that was to be used was not going to be available, so I took into the studio and used for the scene this pistol which I have had for many years. (It was fully functional at the time, I have since removed the firing pin). This pistol is there for the first one ever to appear in a James Bond film. Yours very sincerely, John Bernard Lee"
Bernard Lee played the role of M in 11 Bond films, from Dr. No. (1962) to Moonraker (1979). The auction websites states that the Walther PPK was the personal property of Bernard Lee (who played M) and was gifted to the vendor (referred to as 'your boy' in above letter). The auction website claims that according to EON Productions - the 'call list' for this scene (list of props required for filming) included 'a gun' however, said gun was not available at the time of filming, so Bernard Lee brought in his own. Later in the film, a Walther PP, not a PPK, was in fact used - and likely Bernard Lee's 'live and unregistered' PPK was inappropriate for filming on location and EON's PP was the only substitute available. According to Humbert & Ellis this is therefore the first of the famous James Bond Walther PPKs to appear in a Bond film. Bids for this item starts at £30,000. For bidding and information visit the-saleroom.com. Update 28 November 2018: the auction has now been canceled by the auction house, after doubts about the provenance of the item.